Reeling from her recent divorce, Kate Fox has just been sworn in as Grand County, Nebraska Sheriff when tragedy strikes. A railroad accident has left engineer Chad Mills dead, his conductor Bobby Jenkins in shock. Kate soon realizes that the accident was likely murder. Who would want to kill Chad Mills? Kate finds that he made a few enemies as president of the railroad workers union. Meanwhile his widow is behaving oddly. And why was his neighbor Josh Stevens at the Mills house on the night of the accident? While her loud and meddling family conspires to help Kate past her divorce, State Patrol Officer Trey closes in on Josh Stevens as the suspect. Kate doesn’t believe it. She may not have the experience, but she’s lived in the Sandhills her whole life, and knows the land and the people. Something doesn’t add up―and Kate must find the real killer before he can strike again. Shannon Baker is the author of the Nora Abbott mystery series from Midnight Ink. A fast-paced mix of Hopi Indian mysticism, environmental issues, and murder. Shannon is an itinerant writer, which is a nice way of saying she’s confused. She never knows what time zone she’s in, Timbuck-Three, Nebraska, Denver, or Tucson. Nora Abbott has picked up that location schizophrenia and travels from Flagstaff in Tainted Mountain, to Boulder in Broken Trust and then to Moab in Tattered Legacy. Shannon is proud to have been chosen Rocky Mountain Fiction Writers’ 2014 Writer of the Year. Kate Fox has just been sworn in as sheriff of Grand County, Nebraska. But a railroad accident is going to throw her head first into a job that some feel she can’t do since it’s a man’s job. Kate is not going to let that stop her from investigating. The death is questionable since it seem Chris Mills has made some enemies at work, his wife is acting strange, and his neighbor Josh Stevens was at Chris’ house the night of the murder. This is starting to look like a murder. Kate has recently gone through a divorce so it seems everyone is trying to coddle her which is irritating the heck out of her. She may be a woman but she is not one of those floo floo girls. She has a job and is determined to prove she is more than competent to handle it. And when it is looking like an obvious suspect she listens to her gut and keeps digging. I admit that I have not read the first book in this series, Stripped Bare but I had no problem jumping into this story. I loved Kate, she was so strong and determined to not let people tell her she can’t do something. It was a great mystery and I didn’t know who the killer was until the end. I will definitely be going back and catching up on what I have missed so far. 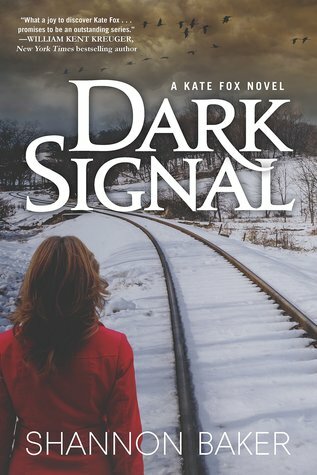 I received Dark Signal from Sami at Roger Charlie and Netgalley for free. This has in no way influenced my opinion of this book.